Oops! Looks like you forgot to select something! We have over 80 colors to choose from, and if you need a specific color, we offer color matching services. Our experienced and talented staff of designers and decal experts are here to help you with any questions or customizations you might need. Our step by step installation instructions are so easy to understand, anyone can install decals! Dance like nobody's watching, Love like you've never been hurt, and Live like there's no tomorrow! 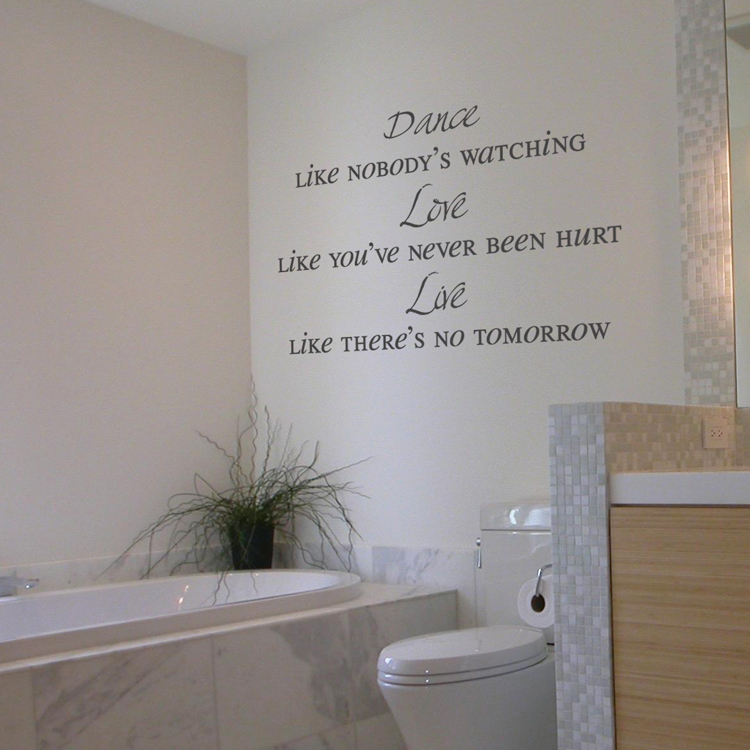 This wall decal is our own take on this inspirational saying that reminds you to make the most of today! Need a different size? Just contact us! All of our wall graphics are customizable according to your specifications. Available in any one color of your choice! This inspirational wall quote decal comes in two sections, for easier application! Practice decals are included with every order. I LOVE LOVE LOVE my stickers. I put the giraffes in my daughter's room. It wasn't super fast, but didn't take forever either, and it looks fabulous. I also put up some cherry blossoms in my guest room and it looks like they were painted on. I rent the house I am in, and it is great not to have to put more holes into the wall. Great products. Thanks! just wanted to thank you for sending the decals promptly, and having such a wonderful, quality product. I was able to add flare to the nursery without having to paint the entire room. It was fairly easy to put up (it was the large tree and I am 9 months pregnant, so I had to get my husband to help me put it up!!). But the birds I did myself and everything was very easy and straight forward. I will gladly recommend this company to friends and family who are looking for something extra for their rooms!! Thank you again! THANK YOU!!! I absolutely love my wall decal. I fell in love with the saying, "the best part of the day, is when you and me, become we". How sweet? I put it right over my bed. I have referred many friends to your website. I will be purchasing more soon. I love, love, love my new wall decal! It does look like if the flowers were painted on the wall - very original. I strongly recommend them to everyone who has empty walls. My decal consisted of 13 separate pieces, and pre-arranging them on the wall in the order and positioned I liked, took the longest. Adhering pieces to the wall was a piece of cake after the very first one. I am browsing the site for another decal, and deciding which wall to use next.